Booniverse » Blog Archive » NINJAS! 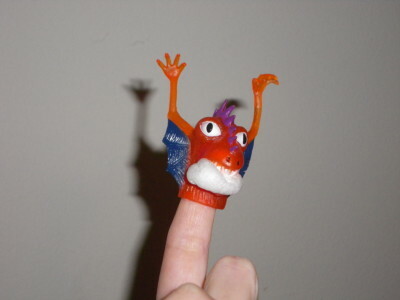 It’s a surprise finger puppet. RARH! 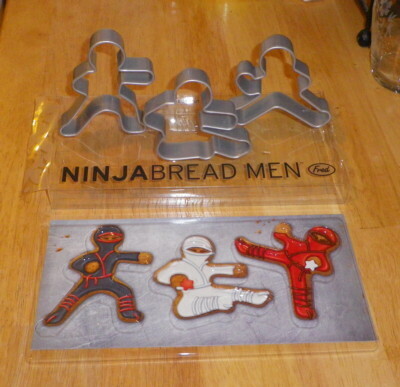 A while back I saw these awesome cookie cutters that were in the shape of NINJAS! so I went to the website (Perpetual Kid) and they said they didn’t have them yet. *sniff* I signed up for e-mail notification and last week I got an e-mail letting me know they were in. Oh SQUEE! I, of course, rushed home and ordered some up, along with a couple other things and the whole kit and caboodle arrived on our doorstep today. Included with my order was a little extra finger puppet with a peanut stuffed mouth so that was pretty cool. The cookie cutters! They are plastic which…hmmm. I am just used to metal cookie cutters but I guess with plastic they won’t reshape themselves. Here the cookie cutters are standing up to give a better angle for viewing. Welll all save the kicking guy, he doesn’t balance on one leg very well. Poor martial form there ninja bread dude. 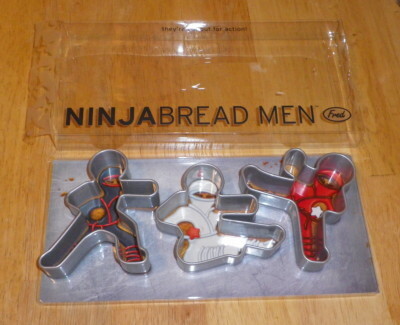 The cutters were packaged with a really cool backdrop of ninja bread cookie men which I do believe I am going to take to work and post on my giant bulletin board. The other thing (that I can talk about…muahahahaha!) 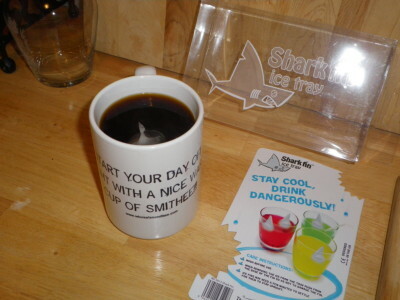 I bought was a shark fin ice cube mold. It makes these fin cubes with a massive base (90% of it in fact!) so that the fin cruises around in the drink. Sadly, we discovered a few flaws with the cubes. There are only five and they end with the pointy pointy fin bit so once you fill the tray (which is wiggly silicon) it doesn’t so much sit as it does balance. Precariously. I sloshed water all down the freezer trying to put these in. Second, the cubes take a bit to right themselves once you plop them in so hot coffee is probably not the best choice for a trial liquid. Here’s a slightly better shot. I will have to make a sharktini later and snap a pic so all y’all can see the full, unmelted glory that is (are?) my shark cubes. Live and learn. 2009: However, as usual I was running around like a headless chicken right up to departure time. 2007: Isaak thinks maybe we shouldn’t have so much vacation because it’s eating into his “loafing about the house while the cat parents are gone” time. 2005: I put the flannel sheets on the bed last night gearing up for winter and oh! They are so cozy, all warm and soft and cocoon like. Mmmmm, cozy. 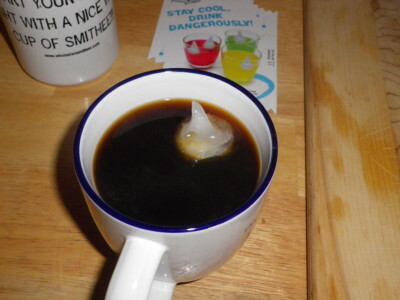 2003: Actually, Jaws would have been a lot less scary if the Atlantic ocean were a giant basin of hot coffee. This entry was posted on Tuesday, November 16th, 2010 at 8:57 pm	and is filed under General Bloggery. You can follow any responses to this entry through the RSS 2.0 feed. You can leave a response, or trackback from your own site.